The former American Radiator Building a black-and-gold gothic skyscraper, towering above Bryant Park. Fashonitas who want to be at the hot spot. 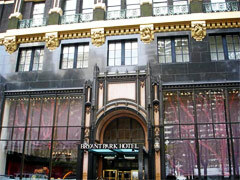 During fashion week this hotel is the most desirable address in New York. The hotel houses 25 stories with over 129 spacious guest rooms including 16 suites, 10 park-view terraces, a penthouse and a rooftop loft space with 180-degree skyline panoramas are bedecked with contemporary décor and signature room appointments that include authentic Tibetan rugs, and travertine marble bathrooms. Koi - fashiony with orchids and dark wood, and a menu of Japanese-inspired cuisine. Cellar Bar - the hotel’s 3,000-square-foot subterranean hang-out for a fashionable crowd of celebrities and young professionals. The hotel has a fitness area that features stationary bikes, treadmills and weights as well as a steam room. Cellar Bar - available for private events. A beautifully restored landmark building in Midtown Manhattan across Bryant Park and the New York Public Library, and a half-block from the Garment District (west) and Fifth Avenue (east). The park across the street hosts New York's famous Fashion Week in September and February, with plenty of celebrities on hand to see and be seen. New York, NY (LGA-LaGuardia) - 9.7 km / 6 miles. Newark, NJ (EWR-Liberty Intl.) - 17.7 km / 11 miles.